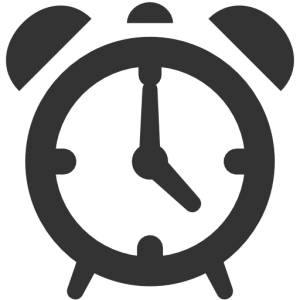 How to get the fastest install | SignPost Install Inc.
How long does it take to complete a Post Install? The typical install is completed 24-48 hours AFTER Miss Utility has completed marking the property. Sadly the days of a same day Estate Post install are long gone. The law requires that all real estate posts that need a tool to install MUST call Miss Utility prior to the installation. Miss Utility states it may take 3 – 5 business days for all utility companies to visit and mark the utilities but often they are done in Virginia it is about 2-3 days, in Maryland it is 1-2 days. The Penalties and Liabilities are extreme and not worth taking the chance. 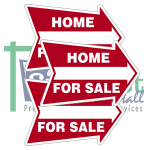 Let’s face it some listings come up fast and you and or your seller want a sign in the ground just as fast. We all know that sign calls can be money in the bank so every day there is no sign is a day of lost opportunity. So what can you do? This page is is here to help provide some suggestions that might help you. What can be installed without calling Miss Utility? Any real estate signage that can be installed by hand or foot pressure does not require a call to Miss Utility prior (insert standard disclaimer 🙂 – Rules and Regulations may change at any time. For current Miss Utility guidelines call them by dialing 811 or visiting their website). Below are samples of what can be installed and how we might be able to help with a rush situation. Option #1 – Set Expectations and Wait for the install. Inform your seller at the signing of your listing that your concern to protect them and their property outweighs the fact that there will be a slight delay with the sign post installation. Remind them that the fees and penalties are high and you require all companies doing your installs to follow the law and call Miss Utility prior to the installation. In this scenario you can safely estimate that the post will be installed no later than 5 days after your order. Our goal is to install within 24 hours of Miss Utility is done. Order some Metal Frame signs like the one shown above, insert your custom panel and let us store them for you. When you have a super hot listing and need a sign ASAP, order this Metal Frame For Sale Sign install and a sign post install. 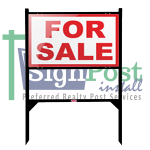 We will install your Metal Frame For Sale Sign ASAP and after Miss Utility marks the property we will return and install your real estate Estate Post and return your Metal Frame sign to inventory. (You can order Metal Frames from Lowen Signs). When you do know a listing is coming up let us know ASAP even before you place your order with us. Fill out the form below to alert us early and we will call Miss Utility right away. There is no cost for requesting this. Just know that the date we install can’t be longer than two weeks away from when Miss Utilty was called or we have to call them again. Also alert the homeowner that the utility companies will be coming out. This is very important especially if they haven’t signed the listing with you yet. We don’t want them confused as to why this is happening. We need to know this as Miss Utility ticket numbers should be no older than 2 weeks at the time of install. Any Special Notes, Comments or Instructions?